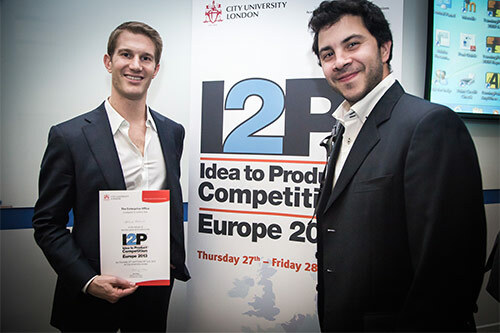 Two postgraduate students from City University London have won the right to compete at the global final of the Idea to Product® (I2P) competition. Andrew Whelan (MBA, Cass Business School) and Alejandro Pena (PhD, Department of International Politics) developed a commercialisation plan for Offshore Extreme, a software solution which can simulate extreme weather conditions. They will represent Europe at the final in Brazil where they will have to convince a panel of industry experts of the viability and market potential of the product. Offshore Extreme originates from the pioneering research conducted by Professor Qingwei Ma and Dr Shiqiang Yan from the School of Engineering & Mathematical Sciences. The software is used for simulating wave, current and wind loading conditions on offshore structures. It provides accurate recreations of extreme weather situations that no existing commercial software can model. "We entered the I2P competition in order to take advantage of the opportunity to share some of the brilliant technology being developed by academics at City. It is an exciting challenge as a LCI Associate to apply our business skills to bring this advanced technology to the world of people who need it." The European leg of the competition was hosted at City and organised by the University's Enterprise Education team. Six student teams took part this year, representing Belgium, Germany, Great Britain, Italy, Ireland and Sweden. Projects presented included fitness products and eLearning resources. They were judged by industry experts and professional investors. "It is excellent to see City students and academics working together to bring ideas to fruition. We are committed to ensuring the right environment and resources are available to enable these relationships to flourish. It is gratifying to see Andrew and Alejandro's work being recognised at an international level. The team's win provides further confirmation that City's approach is delivering results, as well as demonstrating the quality of the underlying research by Professor Ma's group." Andrew and Alejandro will travel to Sao Paulo, Brazil in November 2013 to present Offshore Extreme in competition against the best teams from around the world in the I2P® Global competition.